Gum disease—or periodontal disease—is a big problem in the United States. Many people don’t even realize they have it, and even those who do know they have gum disease frequently are not receiving treatment for it. They are often unaware that the health of their gums can have an impact on overall health, including increasing their risk for diseases such as diabetes, cancer, and heart disease. The good news is that periodontal disease can be treated, particularly when it is caught in the early stages. Even better news is that periodontal laser therapy is now available right here at Prestige Dentistry to treat gum disease without surgery, meaning little or no anesthesia and quicker recovery time. Healthy gums do not just mean an attractive smile; your gums actually protect your teeth from bacteria, keeping disease and decay at bay. But because gums are so susceptible to infection, gum disease is a common occurrence. Not only does it put your smile in jeopardy, but it can mean your overall health is also compromised. Studies show that people with gum disease have a higher risk of contracting other health issues, including heart disease, strokes and other serious health conditions. 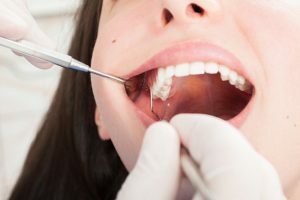 At Prestige Dentistry in both Palm Harbor and Trinity, FL, each of our hygienists is extensively trained in nonsurgical periodontal therapy protocols, such as scaling and root planing. This procedure involves cleaning the teeth root surfaces to get rid of plaque and tartar buildup from deep gum pockets. Once this is done, the tooth root is smoothed so that additional bacterial toxins are removed. Soft tissue laser therapy provides a cleaner, less invasive method of treating gum disease. Because little or no anesthesia is used, patients enjoy faster healing times. Once we remove any tartar and calculus from your teeth, we will use a laser to remove the diseased and infected tissues in the gum pockets around your teeth. The laser will also destroy the bacteria at the root of your gum disease, encouraging healing of the gums. We may recommend laser gum therapy for patients diagnosed with periodontal disease. If you have an infection in the gums, one of the most effective ways to eradicate this infection is by killing the bacteria using a laser. We can pass the laser over the infected tissue and trigger the healing process so that the gums can heal naturally. Some advantages of laser gum treatment include minimal discomfort, minimal bleeding, and faster recovery. Patients who have undergone gum disease treatment should plan on visiting their dentist every three or four months for periodontal maintenance. With our emphasis on preventive care, we aim to ensure our patients keep their natural teeth for their entire lives with care you can count on. Get Your Gum Disease Under Control in Palm Harbor or Trinity! Schedule a consultation with Prestige Dentistry today in either our Trinity or Palm Harbor office to ensure the health of your gums.